“I started playing wheelchair basketball when I was 16 years old. Back then I dreamed that the poor conditions of the sport would get better. I am now 32 years old, and nothing has changed,” said Mohamed Farag, a wheelchair basketball team player for Egypt, pointing to his broken wheelchair as an example of his sport's debilitated state. Camping in the Olympic Centre for Training National Teams in Maadi, Egypt’s wheelchair basketball team practices five hours a day in preparation for the Kuwait Wheelchair Basketball Tournament to be held next month. Speaking with different players and the team’s head coach, Ibrahim Nasr, feelings of disappointment boiled to the surface. “How come the national team players that represent Egypt are playing on 16-year-old wheelchairs?” Farag asked, explaining that this is one of the reasons they did not qualify for the London Paralympics this year despite their skills and hard work. Nasr noted that the players barely get any financial support in return for their efforts. He explained that players have to encamp before tournaments and so they have to take time off work, which jeopardises their monthly income. As monetary compensation for every day they spend in the camp, players receive only LE25 ($4). “But I am wealthy because of the LE150 I get per month from my Imbaba Club,” Farag joked. Egyptian Paralympians who did participate in the London Paralympics this year also share feelings of anger. "The government does not even see us,” said Sherif Othman, who won a gold medal in powerlifting, referring to the injustice they feel as they are not treated equally to Olympians. Othman explained that that the Egyptian Olympian who holds a gold medal receives a monthly salary of LE3000, yet the Paralympian gold medalist gets only LE1000. Othman further explained that at the Beijing Olympics Egypt took only one gold medal, won by champion Hesham Mesbah who received LE1 million as an award. 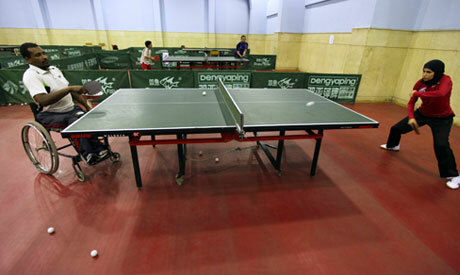 Yet at the Beijing Paralympics, Egyptian Paralympians won 12 medals, four of which were gold. The four Paralympic gold medalists all received LE180,000. On the same rewards issue, Metwaly Mathana, Egypt’s Paralympic powerlifter who won bronze in London this year, explained that they would not be complaining if the government gives modest awards to both Olympians and Paralympians. “We play in the same sports facilities, stay in the same hotels, get the same medals, and we also raise the Egyptian flag high. I do not see why we are not treated equally,” he said. Unlike Egyptian Olympians who get a fixed reward after the Olympics, the Paralympics reward has always been up in the air. It was left for sports ministers to decide because there is no written policy of the exact amount, Housam El-Din Mostafa, president of the Egyptian Paralympic Committee, noted. This year, Egyptian Paralympians received an increased reward amount of LE350,000, in contrast to the LE200,000 they received in the last Paralympics. However, the reward is still far from equal to that of Olympians. “It is disappointing to see Paralympians receive only 35 per cent of the total amount Olympians got this year. After the revolution, we expected to see glimpses of equality,” Mostafa said. “We only win medals because of our willpower not because we are equipped to,” said Randa Tag El-Dine Mahmoud, who won a silver medal in powerlifting in the London Paralympics, elaborating, “Even the basic needs for athletes are not granted, such as having a massage therapist among the medical team during the Paralympics,” Mahmoud said. Egypt’s Paralympians’ record is full of medals. In Seoul in 1988, Egypt won seven medals (one gold, two silver, and five bronze). In Barcelona in 1992, Egypt won 20 medals (seven gold, six silver, and seven bronze) ranking 19th. In Atlanta in 1996, Egypt won 30 medals (eight gold, 11 silver, and 11 bronze) ranking 21st. In Sydney in 2000, Egypt won 28 medal (six gold, 12 silver, and 10 bronze) ranking 23rd. In Athens in 2004, Egypt won 23 medals (six gold, nine silver, and eight bronze) ranking 24th. In Beijing in 2008, Egypt won 12 medals (four gold, four sliver and four bronze) ranking 29th. “All those achievements have not awarded them the recognition they deserve,” Mostafa said, referring to the marginalisation Egyptian Paralympians have put up with. He recalled when the Egyptian government organised a sports celebration in 2010 to honour Egypt’s athletes, they did not invite a single Paralympian. Also, Egyptian Paralympians have suffered media sidelining despite that London’s Paralympics received exceptional media attention in comparison to previous Paralympics. The Egyptian Paralympics Committee established a media department four months before London Paralympics to reach out to different media channels, Mostafa noted. However, other worldwide and regional championships for athletes with disabilities do not get covered despite Egypt’s successes. Mostafa pointed to the 2012 World Deaf Football Championships held in Turkey in July. Egypt’s team ranked second, yet this achievement was not covered by the media. Also, Egypt has succeeded to secure medals in Paralympics over the years because it has been competing in few games, which helped in channelling efforts in but a few directions. "However, we plan to expand and nurture other sports, while, hopefully, maintaining quality playing," Mostafa said. Looking to the future, Egyptian Paralympians seem hopeful. President Morsi’s meeting with them before their trip to London seemed to trigger optimism. Mostafa explained that President Morsi listened to all of their questions and problems without reservations. Mathana said he hopes that President Morsi translates their hopes into action. Also, the way people celebrated their arrival at Cairo Airport on their way back from London made them feel rewarded. “It showed us that people appreciate our hard work and that we are not existing on the margins of Egyptian society,” Mahmoud said. “Why do big clubs, such as Al-Ahly and Zamalek, not integrate us in their basketball programmes, so audiences who are coming anyway to watch basketball games get to see us as well,” Farag wondered.